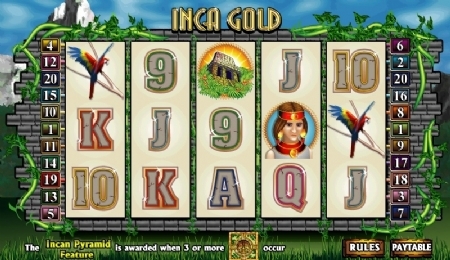 Inca Gold is a sensational slot game. When you combine an ancient theme and a 5 reel, 20 pay-lines, slot game with wild and scatter icons, a bonus feature and free spins there is no end to the fun and rewards. Be rewarded with the Inca Pyramid game when you hit 3 or more Amulet scatter icons on the reels. In this feature you have to find your way to the top of the pyramid by selecting 1 block on each of the levels. By guessing the correct blocks you are either rewarded with mystery prizes or free spins.